In a blog post long ago, I had commented that the central nervous system is immunologically isolated from rest of the body. In the post, I mainly focussed on talking about the need for an isolated system. In the event of inflammation and breach of BBB (Blood Brain Barrier), many different peripheral immune cells are allowed access to the brain. Under normal circumstances, most of the immunological functions are managed by cells exclusive to CNS. Very recently, it has been shown that CNS has a lymphatic system of its own. That means a lot of things that we assumed about CNS immunology is wrong and new research will be needed to rectify older theories. 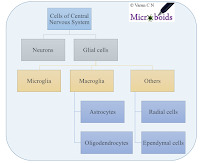 Fig 1: Cells of CNS. Of all the cells, Microglia is considered as the innate immune cell and first and line of defence. Astrocytes were thought of as a cell of importance in neuronal regulation. However, most recent findings conclude that they are important in regulating microglia and function as an immune modulator. Thus they too are included as Immune cells (at least in part) of CNS. Fig 3: Structure of Microglia. Microglia is originally derived from yolk sac during the developmental stage and is exclusively maintained in CNS. In the case of depletion of the microglia, they can be derived from peripheral myeloid cells. The microglia forms roughly 10–15% of all cells found within the brain. They can be identified by flow cytometry using phenotype CD11b+, CD45low. Microglia in the brain exists in 2 possible forms- (i) Ramified or (ii) Activated. Everything described in the literature is one of the 2 forms or an intermediate state. Table 1: Factors involved in activation of Microglia. Ramified microglia are simply resting microglial cells. They are identified by their long thin branching processes and a small cellular body. It has been noted that each microglia has a micro-territory where it works and scans for damage. They are immunologically inactive (They possess very low MHC I/II molecules on their surface). The branching process moves very rapidly around the environment (estimated speed of 1.5 µm/min). These cells are extremely sensitive to changes in the environment. 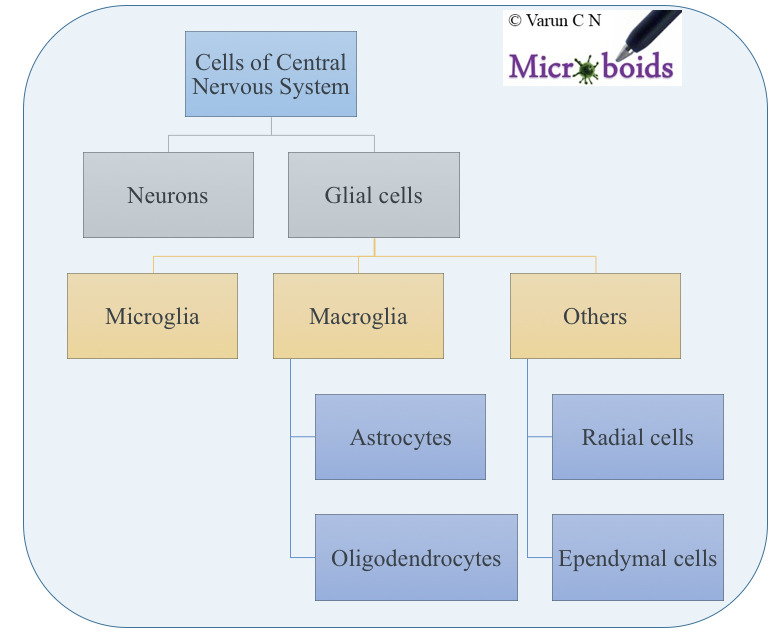 Microglia can be activated several factors. The factors are categorised into 2 types- "Off signal" and "On signal". Other than the innate molecules molecules such as LPS and toxins can activate microglia. In the event of a neural damage, the microglial cells are rapidly activated. The cells become motile, and using amoeboid-like movements and immediately surround the site of damage. If the damage persists and cells begin to die or degenerate microglial cells undergo further differentiation and assume the role of phagocytes. Microglia offers several functions in CNS such as scavenging, phagocytosis, neuronal repair. Even on a day to day basis, several types of cellular debris accumulates in the brain. These are cleared up the microglial cells. One important function is neuronal repair. After an inflammatory event the microglia clears up the cellular mess and induces neuronal repair. This is achieved by secreting anti inflammatory cytokines, recrutiment of astroglial cells and promoting building of neuronal cell network. This is achieved through a mechasnim called as synaptic stripping. 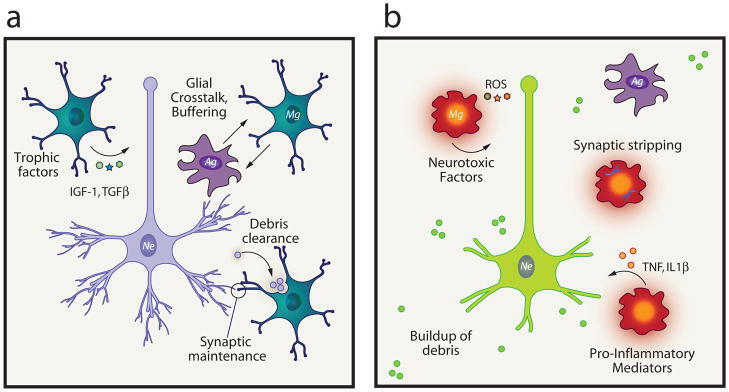 Microglia physically interacts with injured neurons and remove synapses which can extend to removing entire dendritic trees (depending on extent of damage). This allows proper reforming of new synapse and connections. Microglia via its interaction with neuronal cells is recognised to play inportant roles in Mental health, memory formation and neurogenesis. 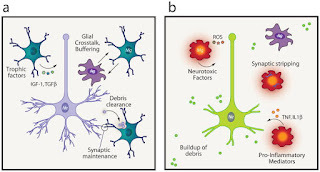 Microglial dysregulation is considered as one of the important factors involved in Behavioral disorders and conditions such as Alzheimers (Lack of phagocytic activity leading to accumulation of Aβ Proteins). Just like Monocytes, and macrophages, microglia can have a range of phenotypes depending on their microenvironment. These are refferred as polarisation states. 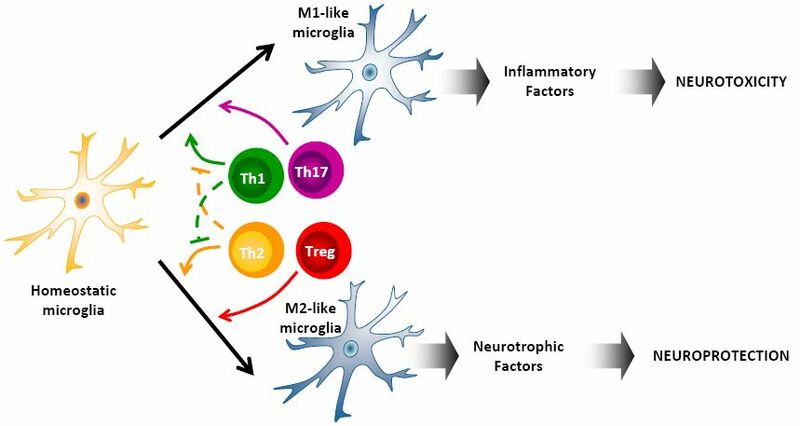 Microglia polarization states can be one of the following- classical activation (M1), alternative activation (M2a), type II alternative activation (M2b) or acquired deactivation (M2c). This polarisation can be achieved through interaction with different types of molecules or cells. 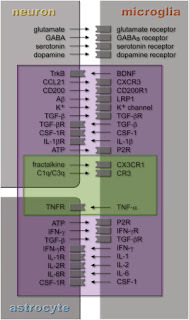 For example, interaction with Th1 and Th17 cells leads to a more M1 like state. Th2 and Treg can influence M2 like. 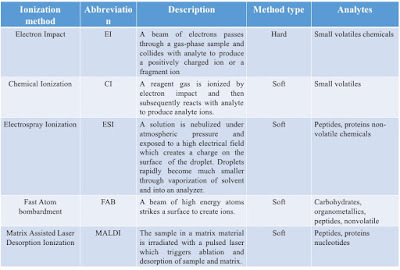 See Fig 5. As already explained astrocytes are not classicaly considered as immune cells. More recently it has however become clear that astrocytes control the microglial activity and the reverse is also true. It's a two way signalling system and both of them are also in direct contact with neurons. Astrocytes form roughly about 40% of the glial cells and are the main supporting cells of Neurons. They are derived from the neuroepithelial cells during development. Their major role in structural (supporting neurons, formation of BBB), metabolic support for neurons (Regulation of ion concentration, fuel supply) and modulate synaptic transmission. Immunologically, Microglia constantly communicates with astroglia via a 2 way signal. For example, Microgllia can be activated by ROS/RNS which can be controlled by Astroglia through soluble anti oxidant factors (thus controlling microglia activation). Another example, astroglia constantly removes K+ ions which otherwise leads to activation of microglia. In the event of chronic microglia activation, microglia can produce excessive quantitites of TNF-α. The excessive TNF-α then dampens the ability of astrocyte to uptake glutamate thereby leading to accumulation and neuronal toxicity (Excitotoxicity). I'm basically illutsrating some examples to imply that astrocytes and microglia immunologically talk to each other. 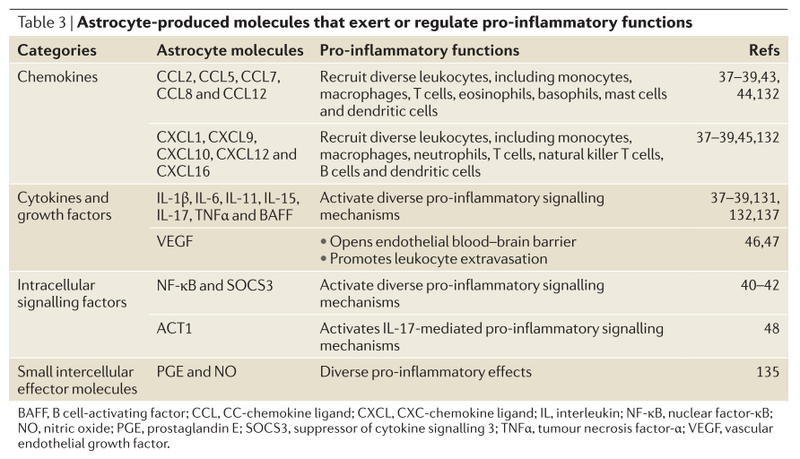 Astrocytes can produce a variety of cytokines which mediates a variety of effects. 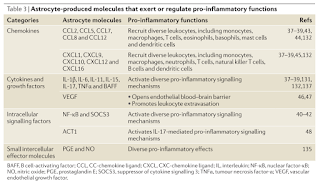 Table 2 is a summation of molecules that exert or regulate pro-inflammatory functions. To summarise, microglia are the primary immune cells of the CNS regulated mainly by astroglial cells. I really like this idea, "If Microglia is the police, Astroglia polices the police". Microglia and astroglia manages the immunology show within CNS, and only when help is needed does it allow peripheral cells to further participate. Louveau, Antoine et al. "Structural And Functional Features Of Central Nervous System Lymphatic Vessels". Nature 523.7560 (2015): 337-341. Derecki, Noël C., James C. Cronk, and Jonathan Kipnis. "The Role Of Microglia In Brain Maintenance: Implications For Rett Syndrome". Trends in Immunology 34.3 (2013): 144-150. Sofroniew, Michael V. "Astrocyte Barriers To Neurotoxic Inflammation". 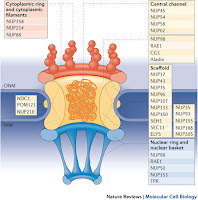 Nature Reviews Neuroscience 16.5 (2015): 249-263. Shih, A. Y. "Policing The Police: Astrocytes Modulate Microglial Activation". Journal of Neuroscience 26.15 (2006): 3887-3888. HIV or Human immunodeficiency virus is a topic that I have blogged multiple times. Every week I see so many publications about HIV. 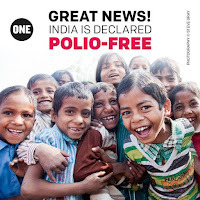 It is one of the absolutely highly researched topics in infectious diseases and yet we neither have a cure nor have a vaccine. Retroviruses in comparison to other groups of viruses have one special property. They are made up of RNA, gets converted to DNA and then integrate with the genome. But what is special to HIV is the way it does it. Simple lentiviral members like MLV (Murine Leukemia Virus) rely on cell division process to integrate their genome to the host. During the cell division process, the nucleus opens and virus gains entrance to the nuclear material. But HIV simply makes its way in through nuclear transport. 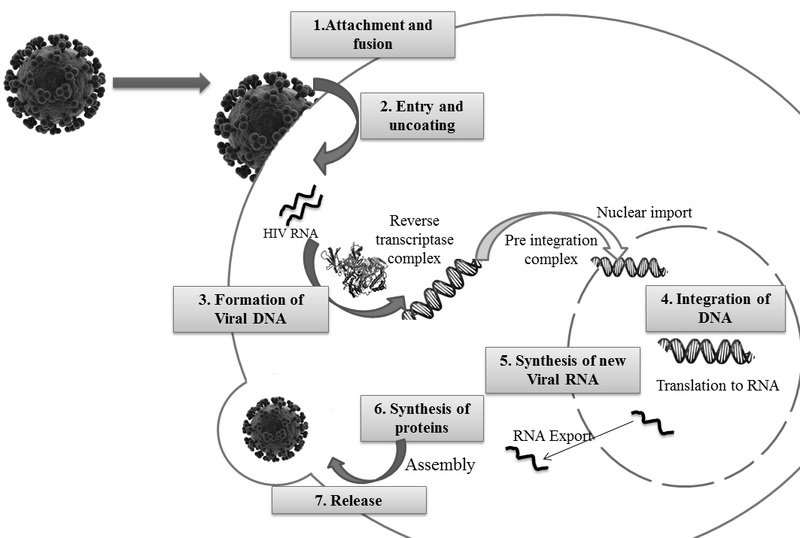 Fig 1: HIV Life Cycle. Nuclear transport of HIV is a well-studied phenomenon. The Reverse transcriptase has three domains: thumb, palm, finger and RNAaseH. This enzyme uses one RNA copy from the HIV genome to make single stranded DNA by reverse transcription and then double-stranded DNA from it. The RNA is degraded by RNAaseH. The presence of 2 copies of RNA facilitates floppy replication and enhances replication errors. The formation of dsDNA continues in the Reverse Transcriptase Complex (RTC), simultaneously migrating towards the nucleus using microtubule network with a cellular dynein-dependent motor complex. On the formation of DNA, the complex is referred to as the Pre-Integration Complex (PIC). Fig 2: Structure of Nuclear Pore. PIC interacts with several different factors that influence its nuclear import. It is currently not clear as to what are the factors important for nuclear factors. Though many of them have been identified which includes TNPO3, NUP358, NUP153, Integrase, LEDGF, CypA, CPSF6 and much more. There is one fundamental problem in understanding the nuclear import of HIV in all the studies. HIV is transported to nucleus through nuclear import factors by passing through the pore. However, the nuclear pore is much smaller than the HIV PIC. So how does it still manage to pass? Let me digress a little bit. The nucleus of a cell is not accessible to chemicals for direct communication. The Nucleus is well guarded and specific channels are provided in the membrane called as Pores. The nuclear pore is a protein-lined channel in the nuclear envelope that regulates the transportation of molecules between the nucleus and the cytoplasm. In a study published by Edward et al; they looked into this question. In the first part of the study, they found that depletion of KIF5B (Kinesin Family Member 5B) and Nup358 (nucleoporin 358) led to the accumulation of viral cores around the nucleus, with a reduction in nuclear import. 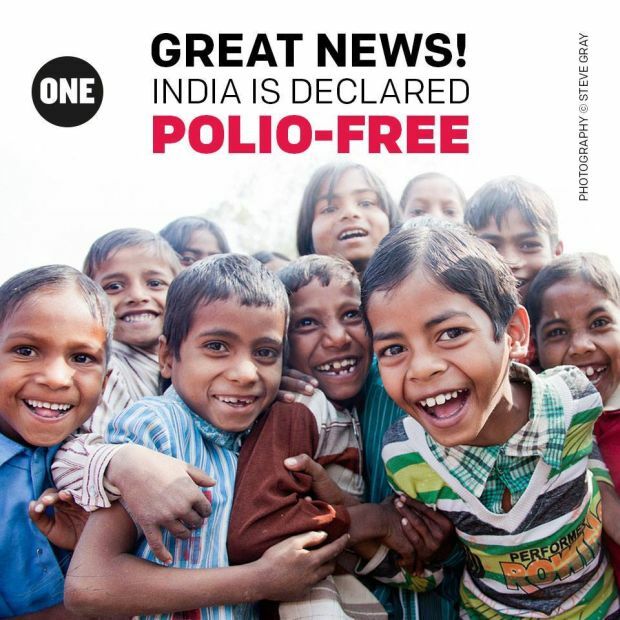 This is consistent with previous reports indicating that these are required for nuclear import of HIV. 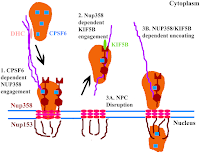 Subsequent investigation showed that HIV-1 induces NUP358 relocalization in a KIF5B dependent manner. 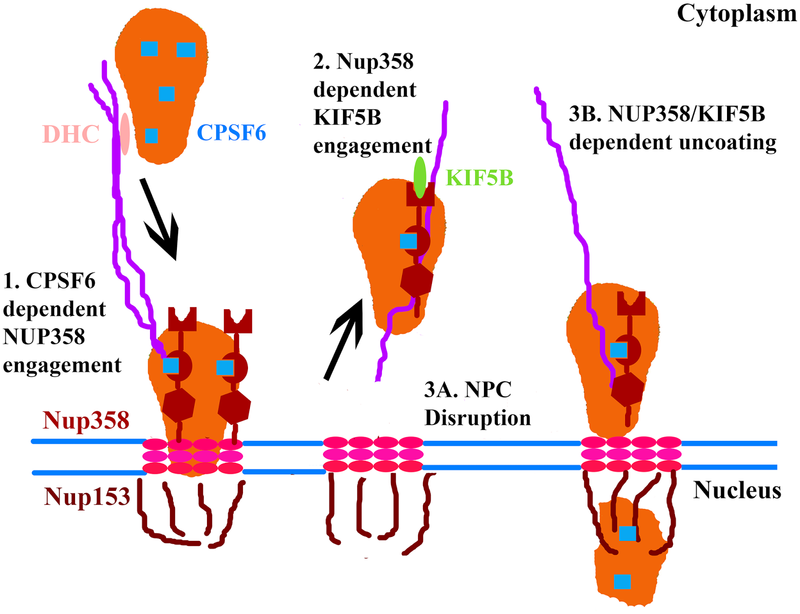 The last part of the experiments yielded that KIF5B transported Nup358 away from nucleus thus making the pore wide enough for HIV to pass through. It is essentially tearing of the nuclear membrane. 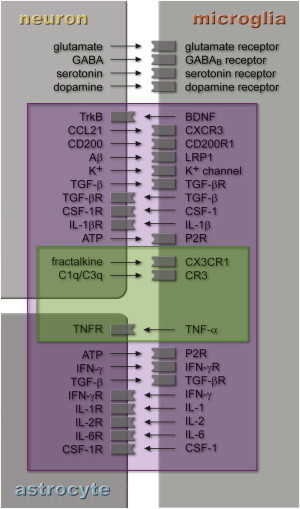 A model of how KIF5B is involved in HIV nuclear import is shown in Fig 3. The authors also noted based on previous studies that failing to import (which means the HIV is staying in the cytoplasm for a longer time), activate cytoplasmic host cell sensors and initiate interferon response. Based on the study it has been suggested that blocking KIF5B-HIV interaction should be able to block the nuclear import and thus give more time for the cell to sense and develop a response. As one of the author states, "It's like making a bank vault harder to break into. In addition to making the money more secure, it would increase the chance of sounding the alarm and catching the burglars." I have multiple times talked about current lacunae in culture based identification of bacteria from clinical samples. As much as is the problem of time involved in classical methods, there is equally a problem in finding the culprit. In an ideal scenario, Microbial diagnostics should be able to catch up the etiological agent by growing them on a media and then subsequently identifying them. In reality, most of the labs are far from ideal. Studies indicate that often microbial identification is missed because there is too much reliance on culture. Long ago I had written a post for why bacterial growth in culture is not as simple as it seems to be (Link). Common media used in the laboratory include Blood agar, MacConkey agar, Nutrient agar, CLED agar etc. Most of these support growth for a limited number of organisms. Let us take an example. Neisseria meningitidis is a well known bacteria involved with meningitis. The growth of this organism has very specific requirements. 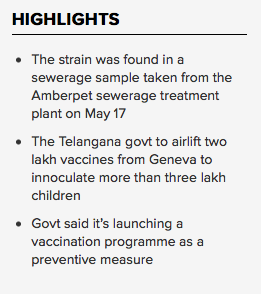 Unless a clinical suspicion has been raised, specialised media mayn't be used. Occassionally despite extensive workup finding a pathogen may turn out to be difficult. 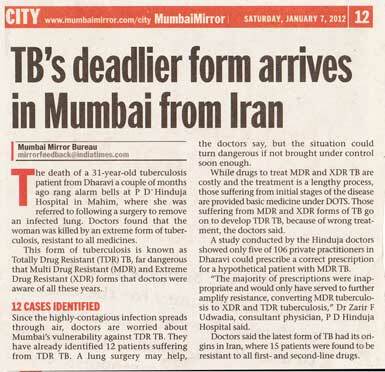 One of the best example that I recall is a case published in NEJM. The case is that of a 14 year old boy. The diagnostic workup of the case was not yielding. A brain biopsy also didnt reveal anything significant. When the sample was tested by whole genome sequencing Leptospira infection was suspected based on finding 0.016% corresponding read. Later, further molecular work confirmed that the patient had Leptospira santarosai infection. Similar studies have been done earlier. Studies have tried to examine if they could find evidence for infection using 16s rRNA PCR and sequencing in clinical samples. 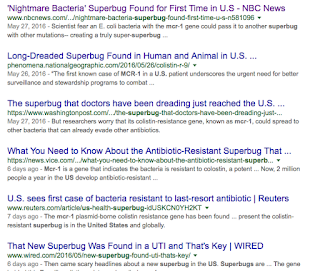 The studies indicate microbiologists are missing a significant lot of cases. It is my understanding from the reports that the microbial identification rate is anywhere between 18 to 40% depending on the techniques used for identification. 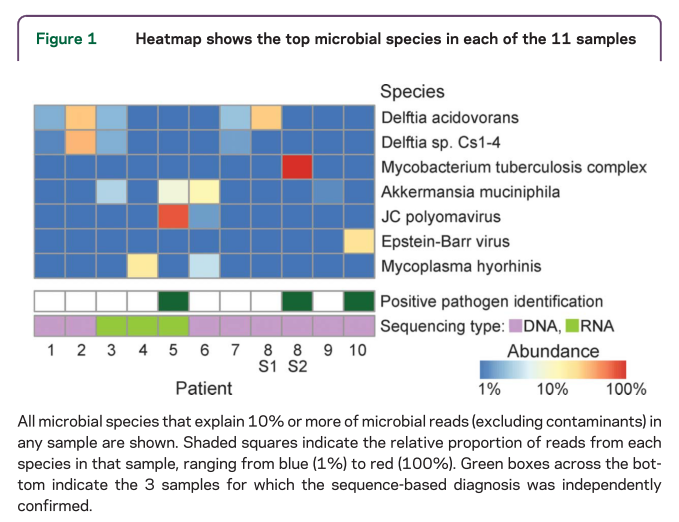 In a recent pilot study paper from Johns Hopkins, showed that using Next Generation sequencing technologies and rigourous bioinformatics, organisms can be identified from clinical samples of brain infection. Pardo-Villamizar says, "By incorporating modern genetic sequencing techniques into pathology diagnostics, we were able to investigate the potential presence of infection in 10 subjects and found appropriate explanations of clinical problems in eight out of 10 patient cases examined in this study. We hope to develop this technique further as a way to bring the diagnosis rate of inflammatory brain disorders and infections closer to 100 percent so we can treat patients more effectively." The study first appeared in bioRxiv. 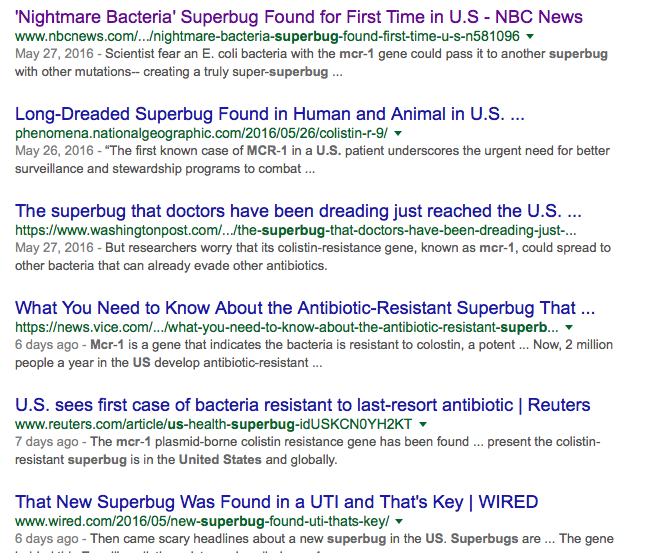 In the study, the number of bacterial and viral reads varied highly (20 to 25,000). 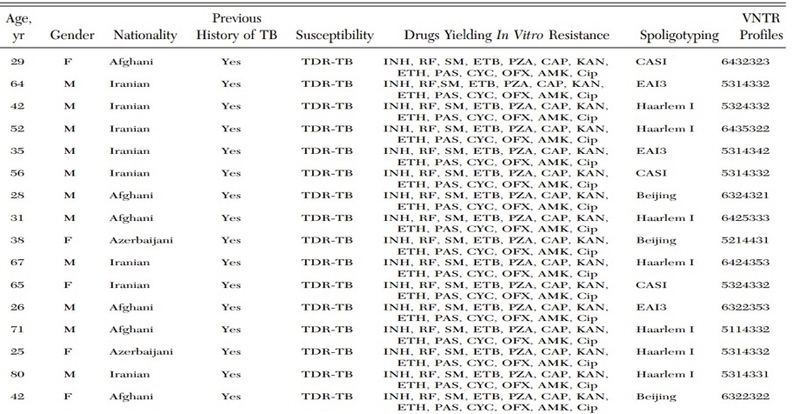 By comparing the sequences to databases identification was possible for infectious agent in 3 out of 10 patients. 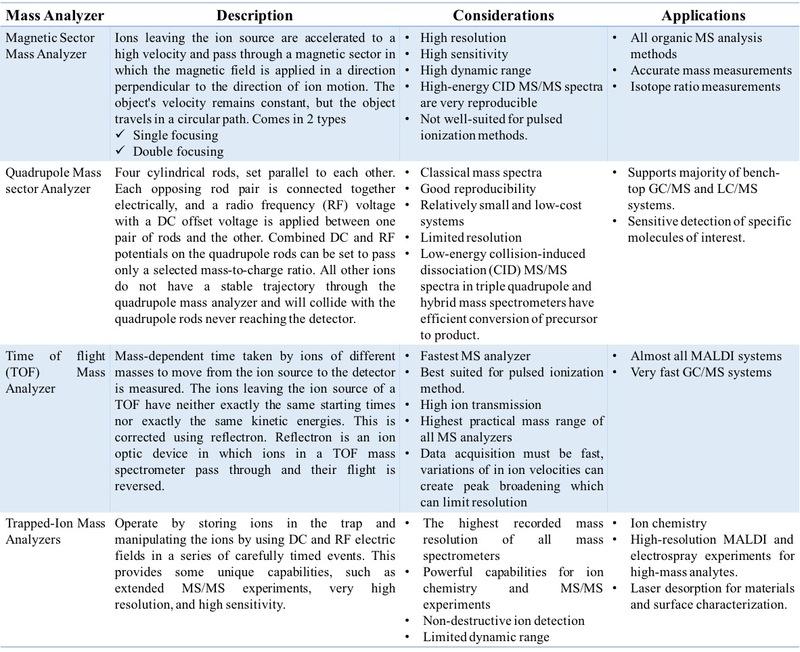 A summary of findings is shown in Fig 1. Of the cases as mentioned, 3 were highly significant. Pt-8 was from a 67-year-old woman with osteomyelitis and lung disease presented with multifocal brain and spinal lesions. The sequencing from samle yielded 15 reads. 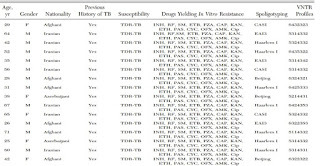 When the data was compared only against M tuberculosis genome, 34 reads could be randomly assigned to TB. 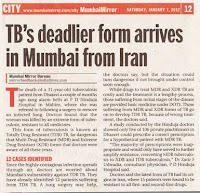 Patient responded well to anti-TB drugs. Pt-5 was diagnosed of JCV and Pt-10 of EBV. In other cases it was not absolutely ascertainable as to if the detection was clinically relevant or not. The study also mentioned that they could identify many different microbial reads which can complicate the findings. 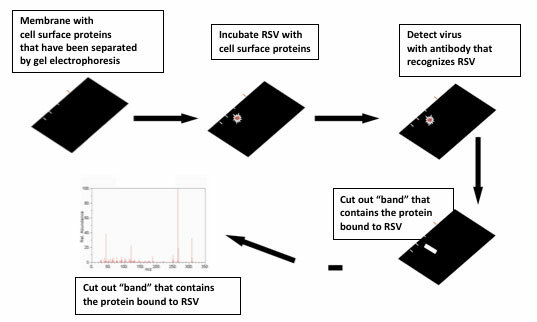 For example, Propionibacterium acnes was detected in all samples, indicating microbial spillover from the intervening tissues probably from collection procedure. The authors also acknowledge that such methods are limited by available database and their completeness. As Steven Salzberg comments, "One of the limitations of using this kind of diagnostic tool is that we can only identify the pathogens for which we have the genetic sequences available. As we continue to sequence the genomes of more organisms, the tool will become steadily more powerful." 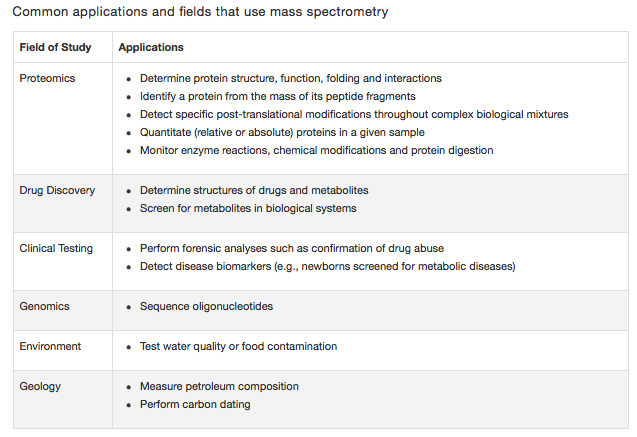 Of course this is not the first study to look at NGS as a method for Microbial diagnostics. But this study comprehensively captures the data of prospectives that we expect in future. I also understand that the scenario is quite easy when it comes to samples such as blood or CNS samples where the microbial identification is easier. But what about samples such as Urine or skin. Sequencing will complicate the data and it would be a lot harder to understand which sequence is relevant since they have a natural microbial load. In an earlier post on PBMC isolation technique, I had talked briefly mentioned about cryopreserving cells for downstream processing. I kept the explanations in brief since the focus was on how to get a PBMC from whole blood samples. In this post, I will focus on details of cryopreservation of cells. Cells have a basic metabolism requirement for survival and hence, all alive cells are metabolically active (By definition). However, when outside the body cells will exhaust their metabolic capability in relatively small time unless continuously maintained in a culture system. 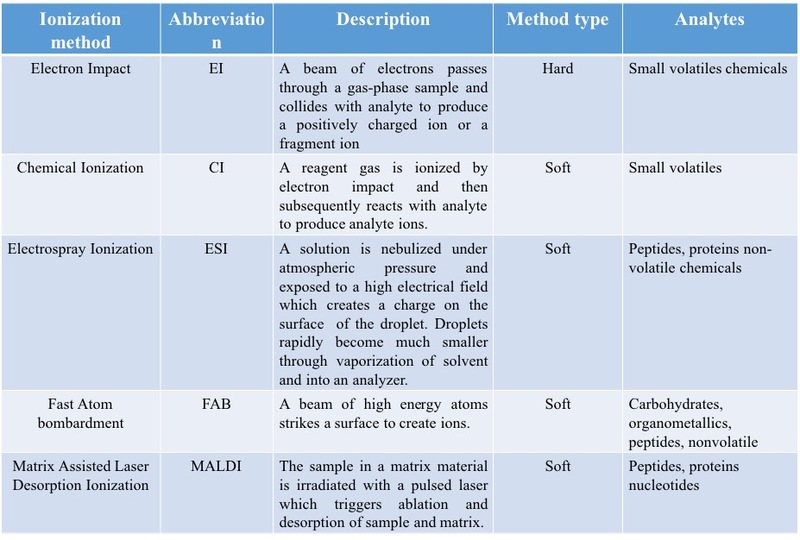 Practically a difficult process and then there is a problem of deviation from original properties of the cell to be studied. Cryopreservation provides a suitable alternative by storing the cells in revivable format. The very low temperatures reduce the metabolism rate to near zero. Cryopreservation is defined as "Use of very low temperatures to preserve structurally intact living cells and tissues". There are several methods defined in the literature, describing the process of cooling the cells. The most well known among them is "Slow cooling technique" and second is a rapid method called "Vitrification". Vitrification is a cryopreservation technique that leads to a glass-like solidification of cells. Oocyte, zygote, embryo and blastocyst freezing by vitrification method for cryopreservation have been used for many years beside sperms preservation. Here I'm restricting the descriptions to slow cooling method. The process of cooling by itself can be lethal to the cells. There are arguments over what exactly causes cell damage. One theory suggests that the slow freezing causes cellular water to convert to ice crystals which damage the cell structure. Cryoprotectants are supposed to act by reducing the formation of Ice crystals. For biological applications, a cryoprotectant must be able to penetrate cells and have low toxicity. Compounds with such properties include glycerol, dimethyl sulfoxide, ethanediol, and propanediol. In simplest terms, cryopreservation enables cells to be stored thus avoiding the need to have all cell lines in a culture at all times. This drastically enhances the lifespan of a cell. In addition following advantages are offered. There are several factors that affect cell viability in cryopreservation. But the most important determining factor is the type of cell to be preserved. Some cells are particularly hard and resistant whereas certain cells are highly sensitive to changes. The Intracellular water content is dependent on the solute concentration of cells. Anything that effects this solute concentration thus also affects the Ice crystal forming properties. It is known for a long time that the rate of change of temperature controls the transport of water across the cell membrane. The solute in the environment of the cell also contributes to this factor. Together they indirectly influence the probability of intracellular freezing and formation of ice crystals. So if we can control the cellular water levels or external osmotic balance we can avoid ice crystal formation. Fig 1: Survival of three different cell types. If the water permeability of the cell membrane and the temperature coefficient of water permeability is known, then it is possible to predict the effect of cooling rate on cell survival. In most cases intracellular freezing is unlikely at 1°C/min. Fig 1, depicts Survival of three different cell types frozen at various cooling rates in 1M DMSO. The figure illustrates that the cooling rate is not a universal value, rather depends on the cell type. Cryoprotective agents (CPA) are divided into two classes- Intracellular agents and Extracellular agents. 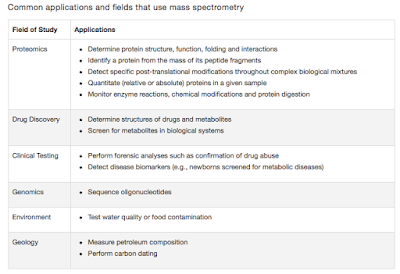 A summary of the classification and description is shown in Table 2. In general, best freezing is obtained with a combination of both types. For example in Storing PBMCs, Ficoll remnants act as Extracellular agent and DMSO is used as an Intracellular agent. There is always some loss of cell viability after cryopreservation. Research is on to identify better CPA's. 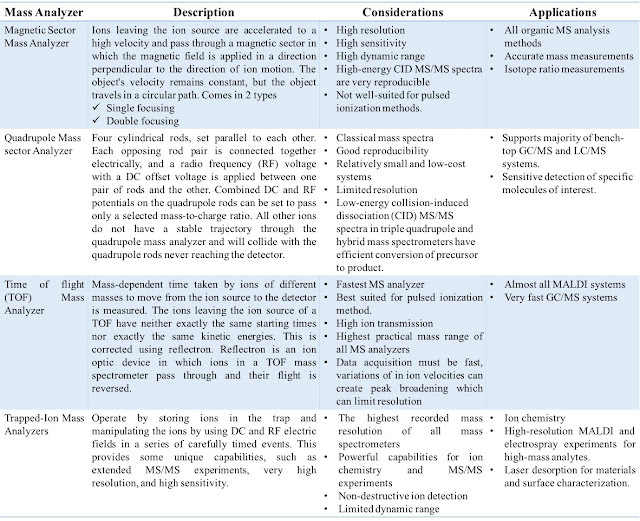 The new generation of chemicals such as Polyampholytes has shown superior properties in comparison to conventional CPA's (Glycol derivatives). Researchers have also studied Proteins found in cold regions (Commonly known as Antifreeze proteins) for their ability to preserve cells in cold temperatures.